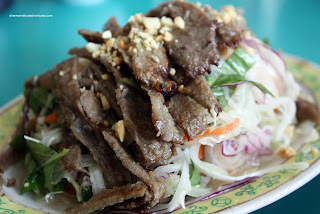 Quick... What is the first thing that comes to mind when you think of Vietnamese food? Pho? Banh Mi? CTV's filthiest restaurants? On that note, it's amazing that most of the places I go are on that list. Ultimately we are at the mercy of what restaurants want to put on their menu. 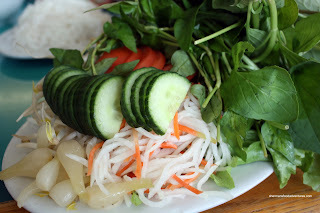 Thus, we are quite familiar with Pho, Banh Mi, Spring Rolls, Salad Rolls and the sort. Not until recently, I tried the Beef 7-Ways at Thai Hang. Well, it was more like Beef 5-ways, since they didn't have the other 2. 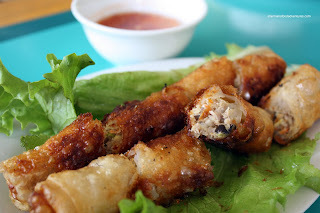 It is offered only in a select few Vietnamese restaurants in town. 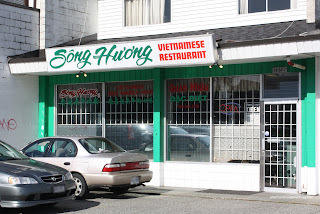 Other than Thai Hang, Song Huong is the only other place I know for sure that serves it. Luckily for me, they have a Surrey location in addition to the one on Nanaimo in Vancouver. Why? Well, Pomegranate and I could swing by for lunch at the Surrey location, not the Vancouver one! The first thing I noticed is that this location is a whole lot smaller than the one in Vancouver. We thought the plastic green bananas and chili peppers with a slight dusting of cobwebs really enhanced the decor. Seriously, it doesn't matter, we were not here for the ambiance... Knowing how we were about to eat lots, I picked a larger table (from my last experience at Thai Hang, you need space for this meal!). I know the the last time at Thai Hang we only got 5 ways although the menu stated 7. 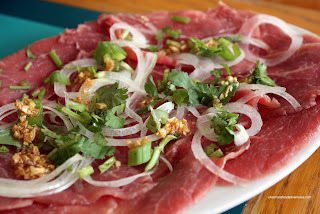 The menu here at Song Huong specifically states Beef 5-Ways. There is no Beef 7-ways! Has downsizing and belt-tightening affected this meal as well? What's next? Beef 1-way? Isn't that just a "steak" here in North American cuisine? I certainly hope this trend doesn't continue! Fine, 5-ways it is... I guess for that reason we added an order of spring rolls to make up for the missing 2 courses. The crispy blistered exterior gave way to a "tight" filling of meat, vermicelli, carrots and wood ear mush rooms. I mention that the filling was "tight" because it was a whole lot better than the one at Bao Chau. The one there was mushy and loose. The next beef dish was the Satay Beef. Buoyed by a mound of picked veggies, there was actually very little meat here. Furthermore, the meat was also quite chewy and dry. The beef at Thai Hang was both more tender and flavourful. 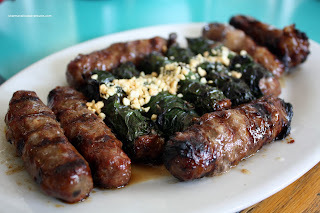 Apparently, the 3rd, 4th and 5th courses of beef were the beef meatballs/sausages. One version is wrapped in pepper leaves. Another is wrapped in fat and one is more sweet. However, I have a hard time differentiating between the two, except one has onion. By the time we were finishing up, we were stuffed beyond belief. Seeing that his meal will only set you back $26.00, it is a good value. However, it's really too bad that there wasn't the 7-co urse option. It's funny how I've had this meal twice and have yet to experience the full 7-courses. I may need to do this next time I'm in California since it is more prevalent done there. But for now, I'm more than satisfied with this unique meal that is definitely a change from the usual pho options. Good write-up, Sherman! It's nice to hear there's Beef X Ways on the other side of the river. Looks like you're mastering the wrap technique! Kudos! oh, cool... i want to make my own salad rolls! i tried doing it once and it was a huge mess. i think i ripped the wrapper every single time - they're too delicate for my grubby paws. i would have a lot of fun making a mess though. Karl, I have not mastered anything... LOL.. it's just "better". Kim, I wonder if they still have beef 7-ways at the Vancouver location? Yeah, I suppose "mastered" is a loaded term! Practice makes perfect and all that. 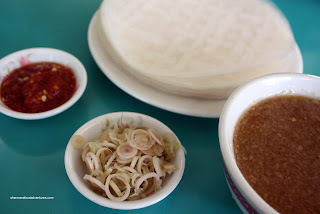 Speaking of practice...maybe a visit to Song Huong with Kim (if you're up for it)? It'd be cool to do re-visit of my very first post with a DSLR! Wow, I haven't heard of this place. But I must check it out because I live fairly close. I need to check out all of your Surrey reviews, so I know where to eat, you seem to be around quite a bit =) and you know more places than I do and I've lived here for my entire life haha..